SCARCELY HAD the terrible news from Copley Square broken when the somber prediction began to be heard everywhere: Boston will never be the same. The Marathon will never be the same. Patriots Day will never be the same. After such a gory and public atrocity on what is normally such an upbeat, festive day, that was a wholly understandable reaction. "There goes another piece of our freedom, another sacred and oh-so-local institution," wrote the Boston Globe's Dan Shaughnessy in his column yesterday. The horrifying images and grisly details of the first successful terrorist bombing on US soil since Sept. 11, 2001, are now indelibly etched into Boston's memory. The dead will soon be laid to rest, the shattered glass and blood will be cleaned up. But the heartbreak and shock of this week's attack will cast a shadow over the city for a long, long time – never more so than on each Patriots Day to come. Yet when it comes to what we value most about life in Boston and every American city — the feel of freedom, the relish of an open society — I'm betting that things are going to be the same. Yes, even now. Remember that after 9/11, too, we were told that nothing would ever be the same. If anything back then was universally taken for granted, it was that more massacres were on the way – a matter of when, not if. Even with beefed-up security procedures and strengthened counterintelligence tools, America would never be able to protect all of its open places from determined terrorists. I'm sure I wasn't the only person who used to wonder why terrorists would bother targeting airports or other fortified public facilities when they could wreak just as much havoc almost effortlessly by setting off a couple of bombs in a crowded supermarket or a busy public park. Our enemies likewise anticipated more slaughter. Terrorist mastermind Khalid Sheikh Mohammed later confessed that Al-Qaeda had intended to follow up 9/11 with additional attacks on the Sears Tower in Chicago, the New York Stock Exchange, and the US Bank Tower in Los Angeles. Yet those attacks never came. The last 12 years have not been terror-free, of course. There have been terrorist shootings – most notably the Fort Hood massacre in Texas in 2009 -- and a number of thwarted plots and fortunate near-misses. 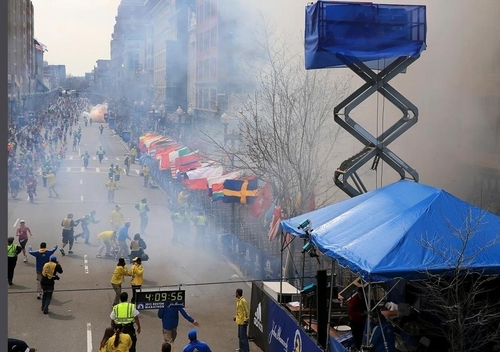 But not until Monday's bombings on Boylston Street did terrorists succeed in achieving the kind of public carnage in wide-open spaces that so many feared would be inevitable. Until we know more about those responsible for this week's savagery, it is foolish to speculate about the motives that drove them, or whether Boston represents a new kind of terror threat calling for fresh security measures or counterterrorist policies. Right now, all of us have a lot more questions than answers. But even without knowing whether this was the bloody work of right-wingers or left-wingers, home-grown extremists or foreign haters, an organized group or a solo fanatic, we can be confident of at least this much: American freedom – including the freedom to run marathons, celebrate local traditions, and refight the battles of Lexington and Concord – isn't about to evaporate. Colonial Minutemen took up their positions on Lexington's Battle Green on Monday. The start of the American War for Independence – the fighting in Lexington and Concord – is reenacted each Patriots Day in Massachusetts. If the years since 9/11 have taught us anything, it is that Americans are jealous of their liberties and not about to relinquish them – not even in the cause of pre-empting terror. Nearly every post-9/11 change in domestic security policy – from the Patriot Act to airport security scanners – has been decried as another step down the slippery slope to a police state. But we haven't slid down that slope. Freedom still thrives in this country, and we are not about to surrender our liberties and our heritage by going overboard in pursuit of safety. Terrorism is a potent threat, and it calls at times for potent responses. But Americans have met more than two and a half centuries of potent threats without forfeiting the love of freedom that is indispensable to our way of life. Whatever else changes between now and next Patriots Day, the resilience of American liberty will not.